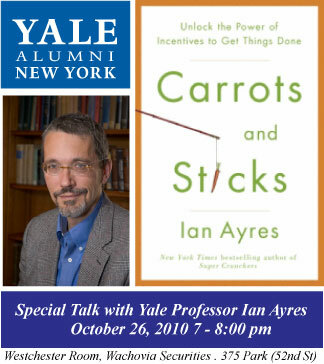 The Yale Alumni Association of Metropolitan New York and the School of Management Alumni Association New York chapter are pleased to announce an evening with �Professor Ian Ayres�(TD '81, YLS '86),�William K. Townsend Professor of Law at Yale Law School and a professor at Yale's School of Management, on�Carrots and Sticks: Unlock the Power of Incentives to Get Things Done. In�Carrot and Sticks, Professor Ian Ayres, the�New York Times�bestselling author of�Super Crunchers, applies the lessons learned from behavioral economics the fascinating new science of rewards and punishmentsto introduce readers to the concept of commitment contracts: an easy but high-powered strategy for setting and achieving goals already in use by successful companies and individuals across America. As co-founder of the website�www.stickK.com�(where people have entered into their own commitment contracts and collectively put more than $3 million on the line), Ayres has developed contractsincluding the one he honored with himself to lose more than twenty pounds in one yearthat have already helped many find the best way to help themselves at work or home. Join us for an evening in which Professor Ayres will share strategies that can give you the impetus to meet your personal and professional goals. This program will last from 7 to 8 p.m. and will be followed by an informal reception with light refreshments from 8 to 8:30 p.m. Please plan to arrive early as you must check in with the security desk in the building lobby prior to being directed to the event space.